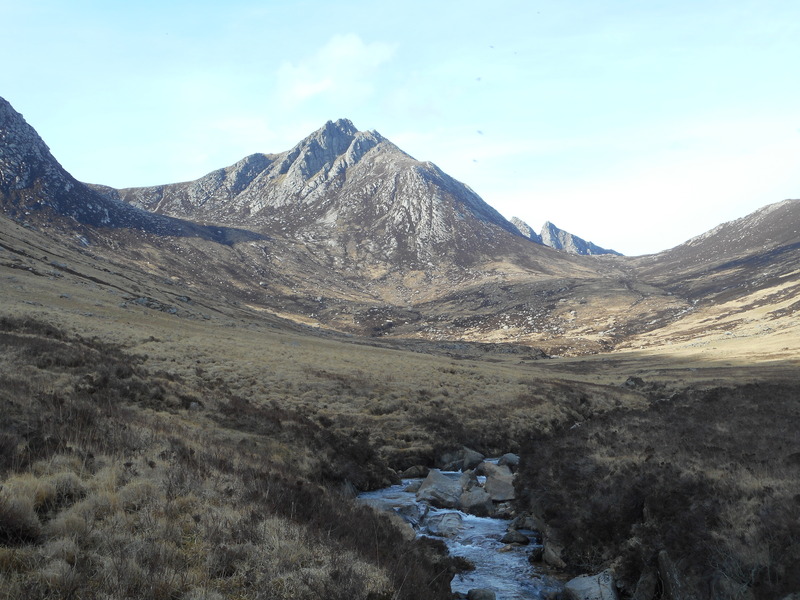 The through route between Glens Sannox and Rosa, via The Saddle, is often said to be the best walk on Arran that doesn’t actually ascend to a mountain summit. 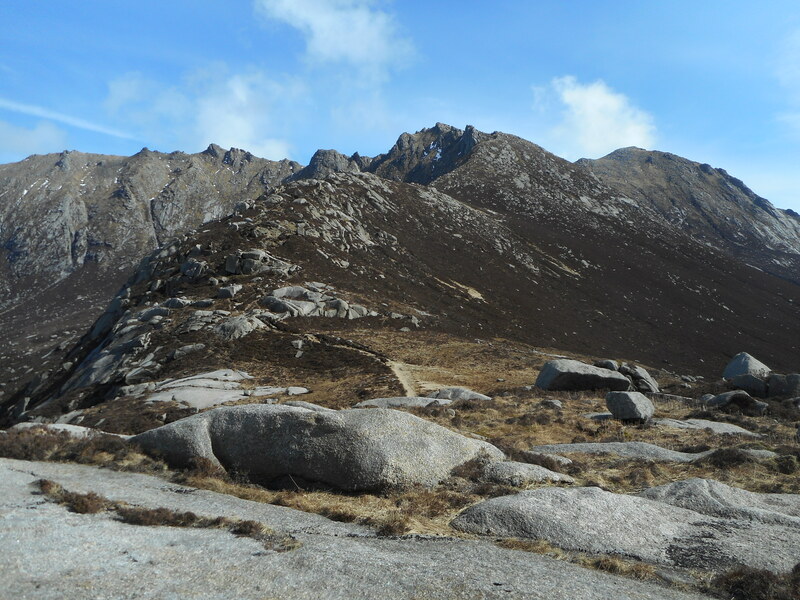 It’s still a mountain walk though – The Saddle is at an altitude of 1417 feet on the ridge that connects Goat Fell with Cir Mhor, and given that both ends of the route are at sea level, there’s a fair amount of ascent and descent. 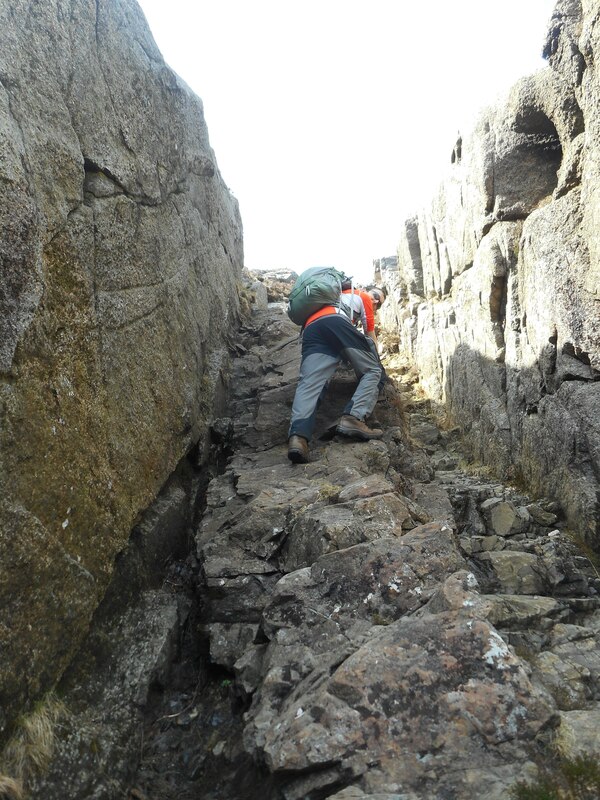 There’s even a short section of scrambling to add a bit of excitement to the outing. Throughout the ferry crossing, we’d been in thick fog, though given the excellent forecast we were optimistic that this would either burn off or that we’d climb through it and witness a cloud inversion. 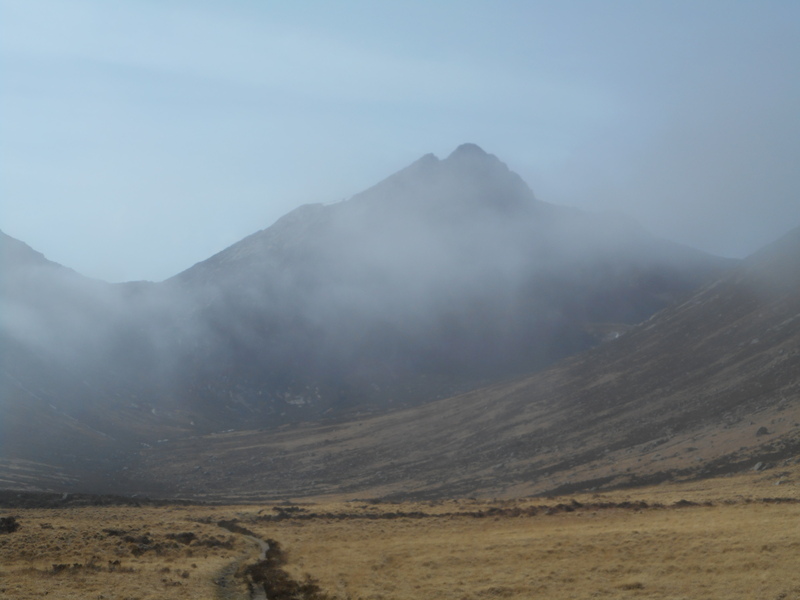 It was still pretty foggy as we left the bus at Sannox and headed up the bottom of the glen, so we didn’t rush, in the hope that the clouds would begin to part. 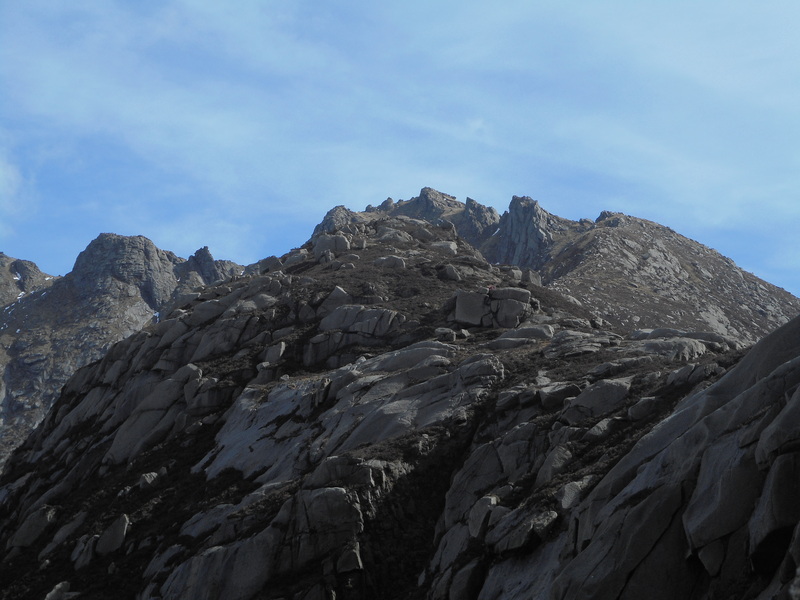 Luckily, our optimism wasn’t misplaced, as the clouds started to clear the tops after we’d been walking for a couple of miles, so for the first time we were able to see the mountains that enclose the glen: Goat Fell, Cir Mhor and Caisteal Abhail. 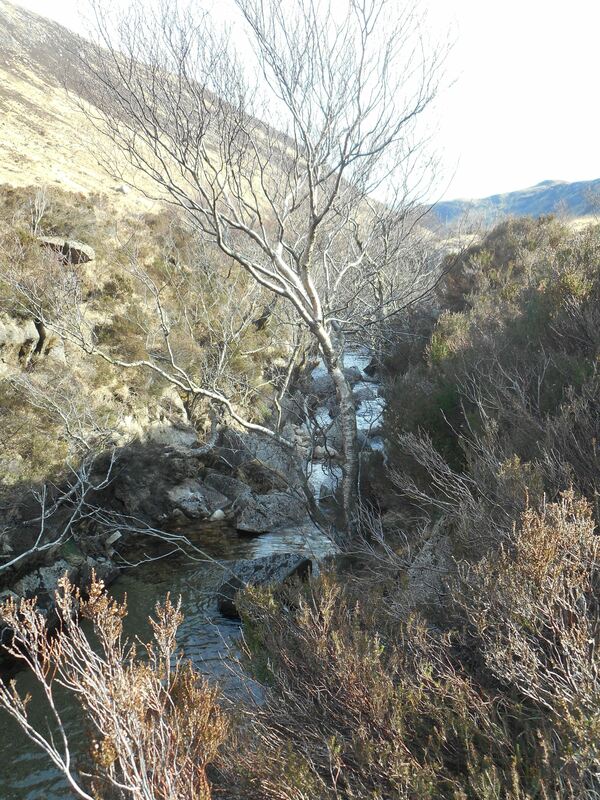 Just before we began the climb out of the glen, the path crossed the Sannox Burn, from which we were able to refill our water bottles and enjoy some of the tastiest water I have ever drunk. 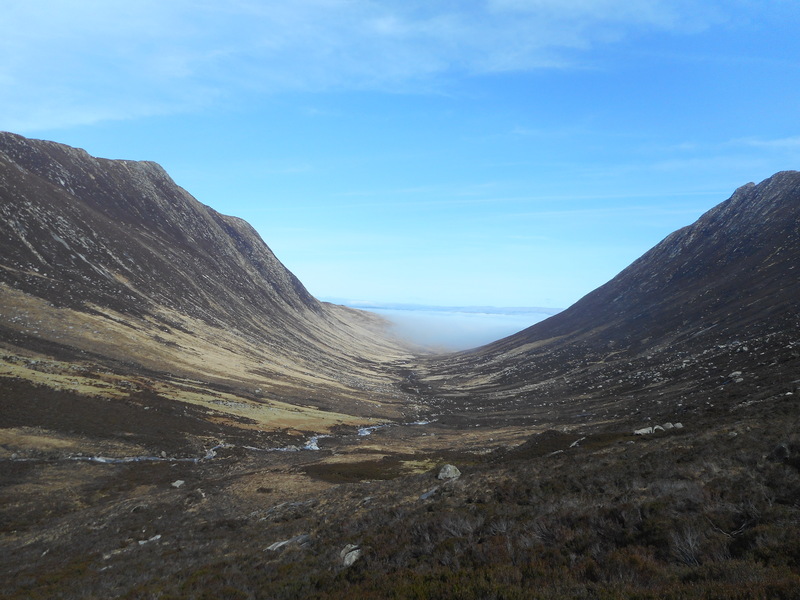 As we began to climb, exciting views opened up towards Caisteal Abhail, and we were still able to catch glimpses of the fog hanging over the sea. Just before the summit of The Saddle is reached, there’s a short scramble up Whin Dyke, though it’s fairly straightforward (grade 1 at a guess). 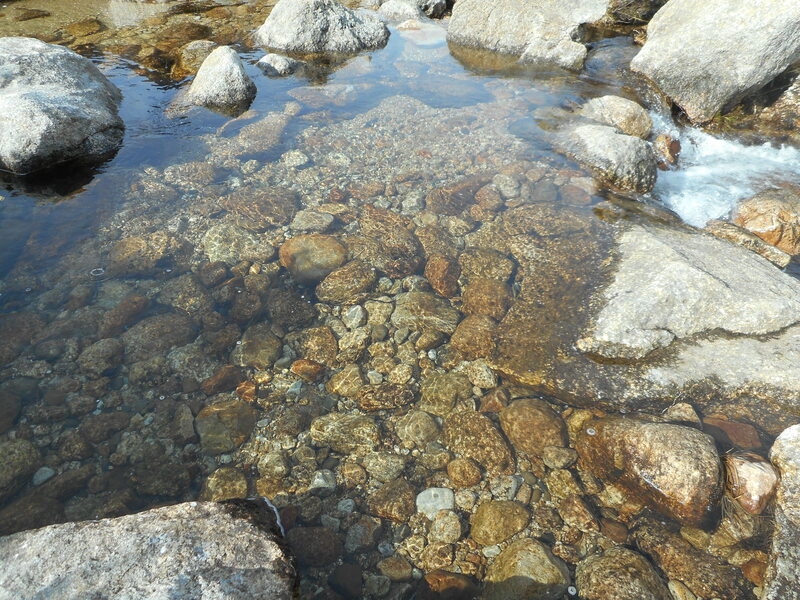 There is some loose rock though, so you do have to be careful, as I found to my cost! The summit of The Saddle made a superb picnic spot and gave us ample time to take in the magnificent views. 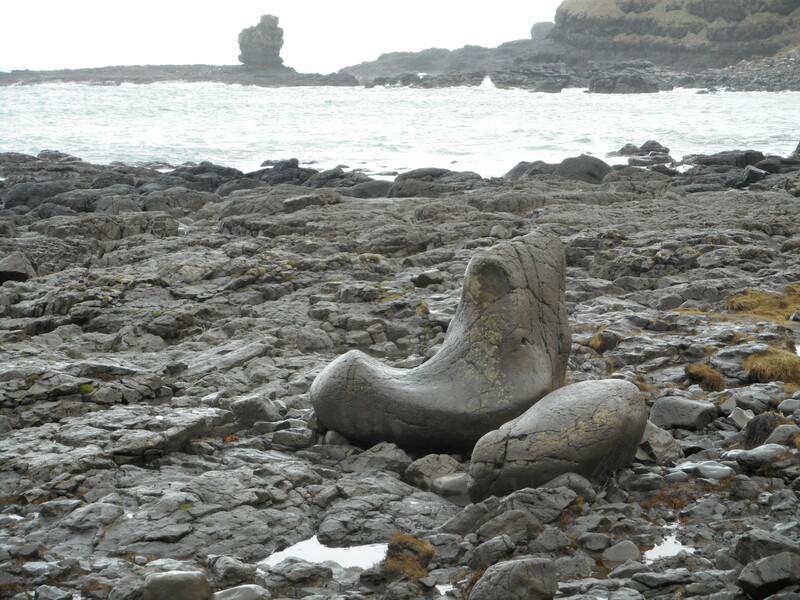 My interest was also aroused by a curious looking rock formation that I took to be some kind of volcanic intrusion, but so far I have been unable to verify this. 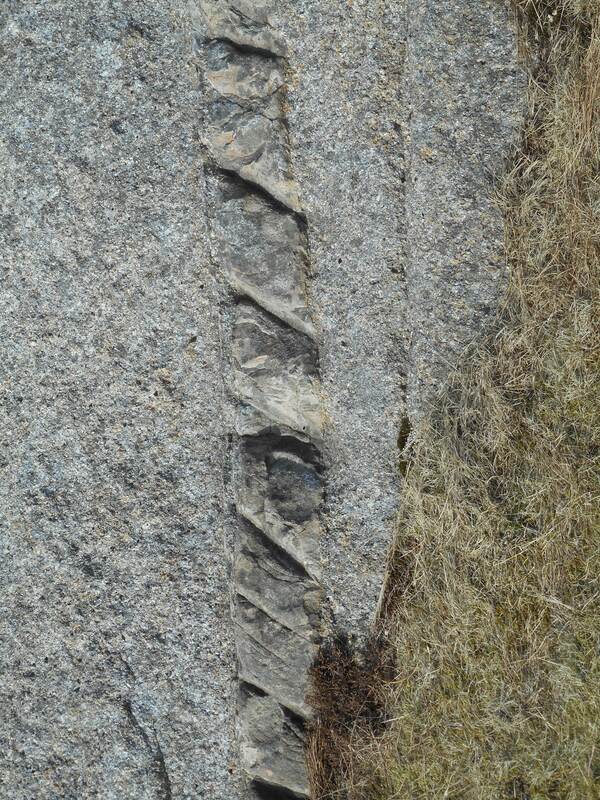 Perhaps some kind geologist will be able to identify it for me? The only problem with walking over a pass is of course that as soon as you get to the top, you have to start going down again! 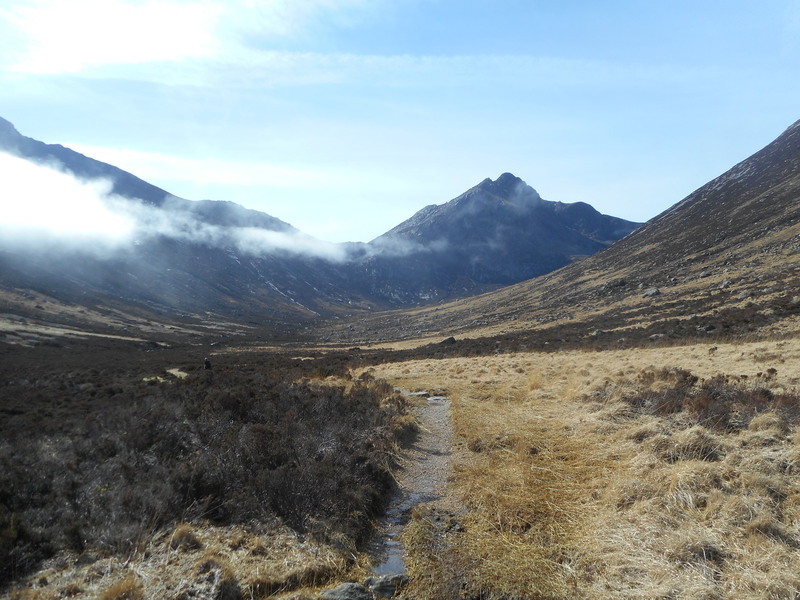 Thankfully the descent into Glen Rosa is fairly kind on the knees, and the views back up to the peaks are equally as stunning as those from Glen Sannox. 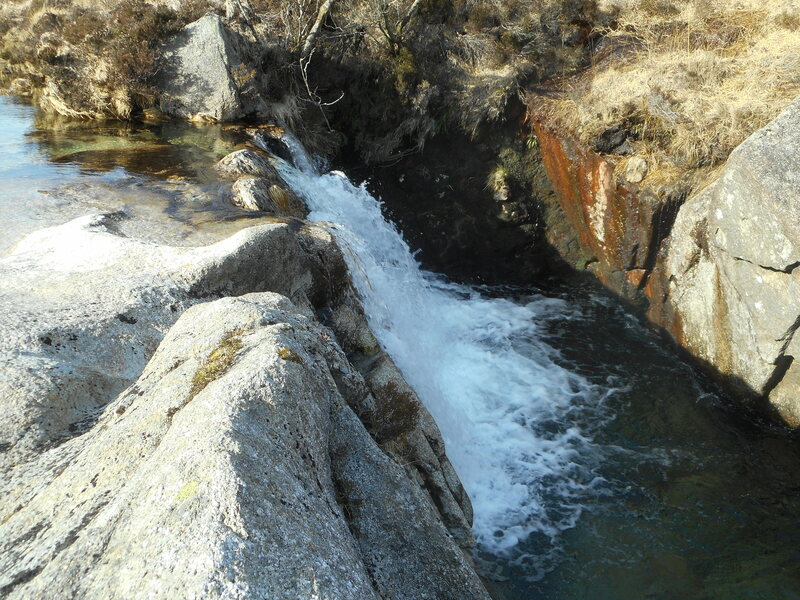 The burn running through the glen also offers plenty of interest and beautifully clear water. 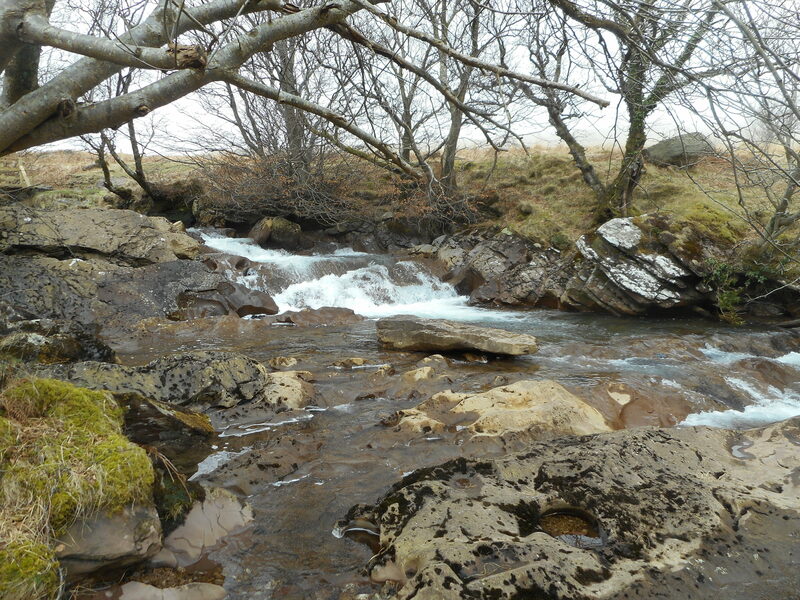 In its lower reaches, the burn enters a narrow rocky gorge and the National Trust for Scotland has erected a deer fence around an enclosure here to allow the natural woodland to regenerate. It was heartening to see that the scheme is already reaping rewards, with birch and pine trees starting to return, even if the fence itself is something of an eyesore. 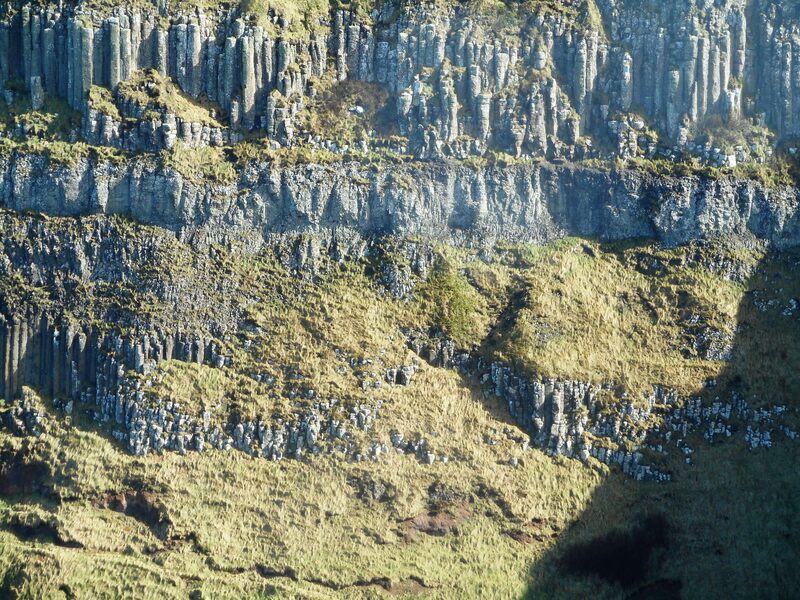 It was around this area that we saw a golden eagle, a life tick for me and consequently a matter of great excitement! We watched it for some time as it soared above the Goat Fell ridge, though unfortunately it was too far away to get a decent photograph. Nevertheless, it was undoubtedly a highlight of the walk. 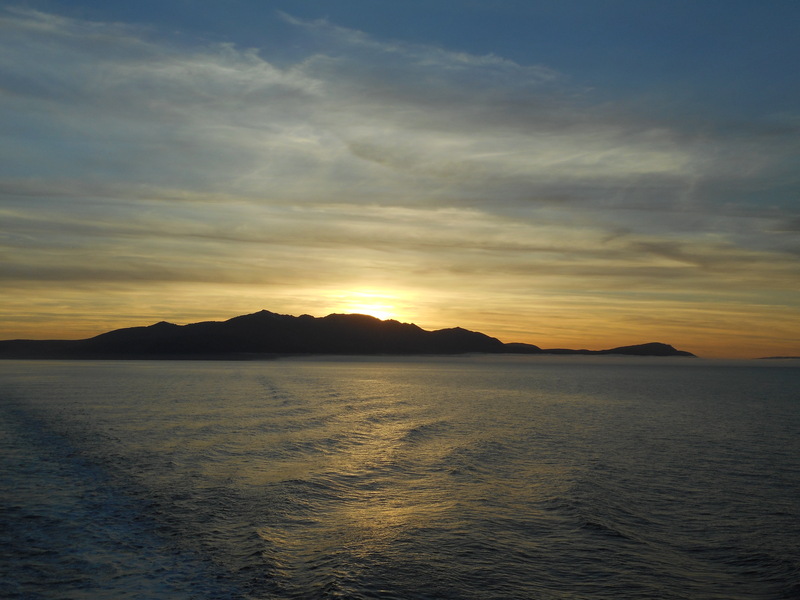 Even after the excitement of seeing a golden eagle, the day had one last treat in store for us – a glorious sunset as we sailed back to the mainland. 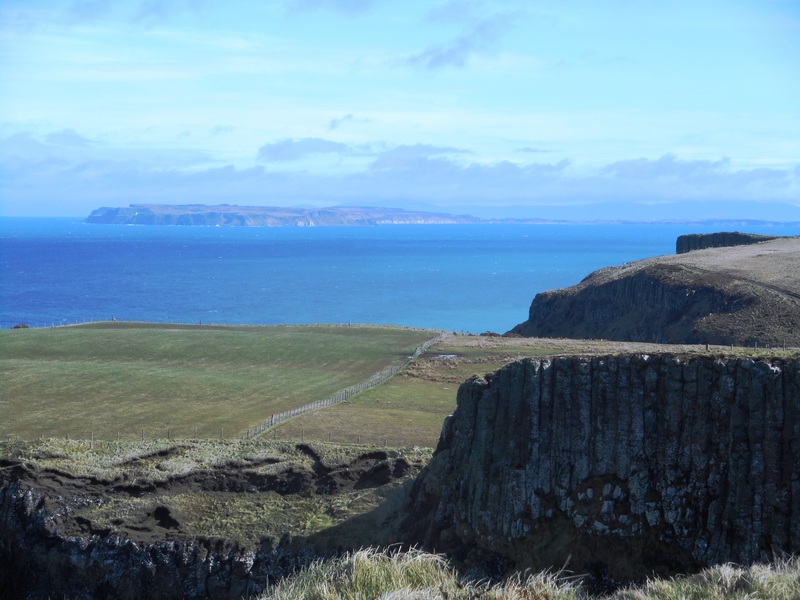 This entry was posted in Scottish Highlands & Islands on May 18, 2015 by neilsmountains. 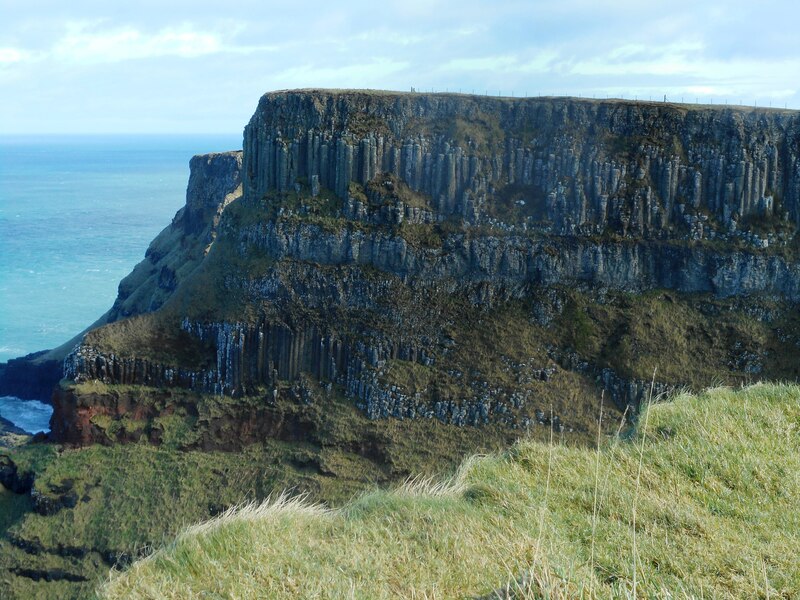 The Causeway Coast in County Antrim has to one of the most spectacular stretches of coastline anywhere in these islands. 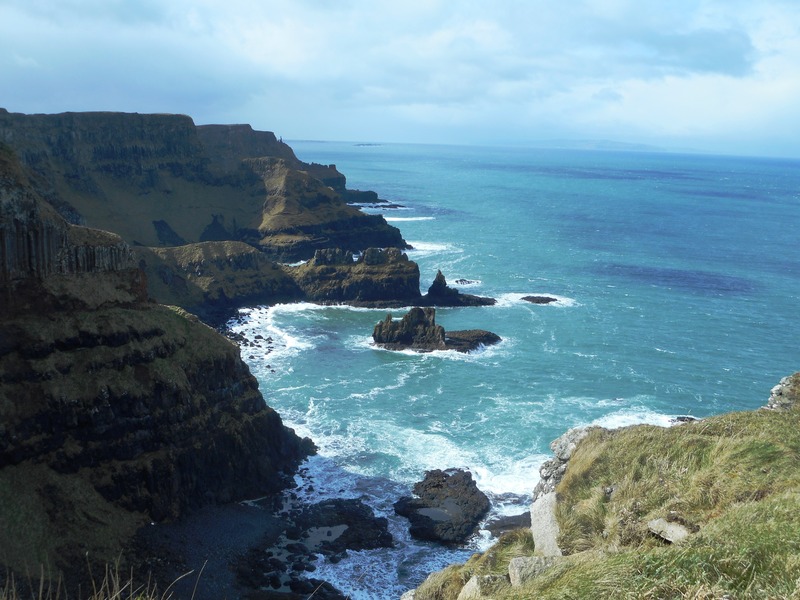 I’d wanted to visit the Giant’s Causeway and Carrick-a-Rede for some time, and with the walk between them being somewhere in the region of 10 miles, it seemed a good plan to walk from the one to the other, using the helpful bus service to make the journey in the opposite direction. Things didn’t look too promising when we alighted from the bus at the Causeway; the rain was heavier and more persistent than the forecast had suggested and didn’t seem to be in too much of a hurry to move on. 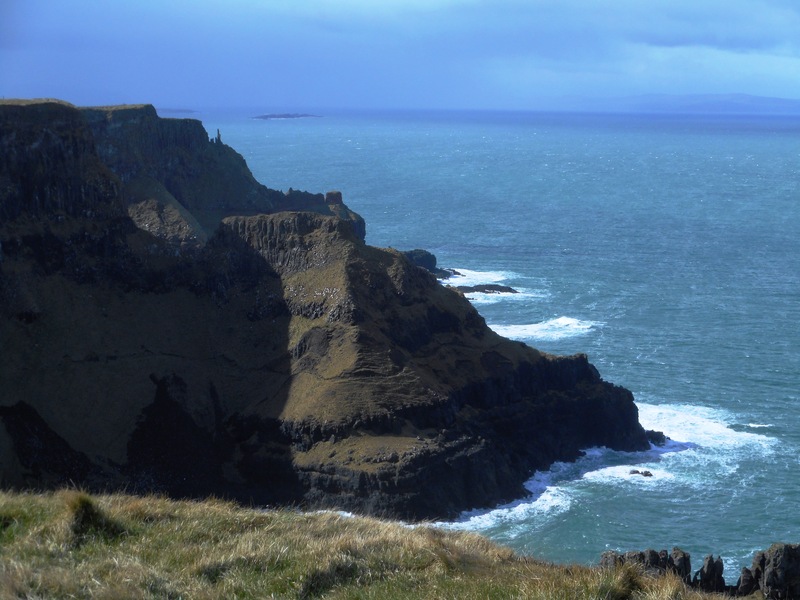 Undaunted, we headed down to the Causeway itself, telling ourselves that it was better to come on a wet and windy day, as this would keep some of the tourists away, and make the sea more dramatic. 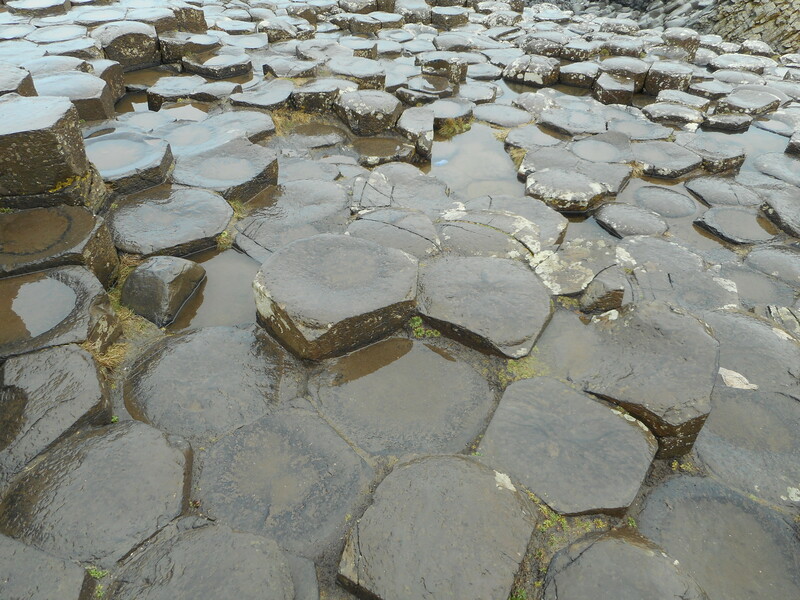 The Giant’s Causeway seems to divide opinion – I’d been told by some people that it was disappointing, while others had said it was one of the most spectacular sights they’d seen. I suppose it all depends on what you’re expecting. Personally, I thought it was amazing. 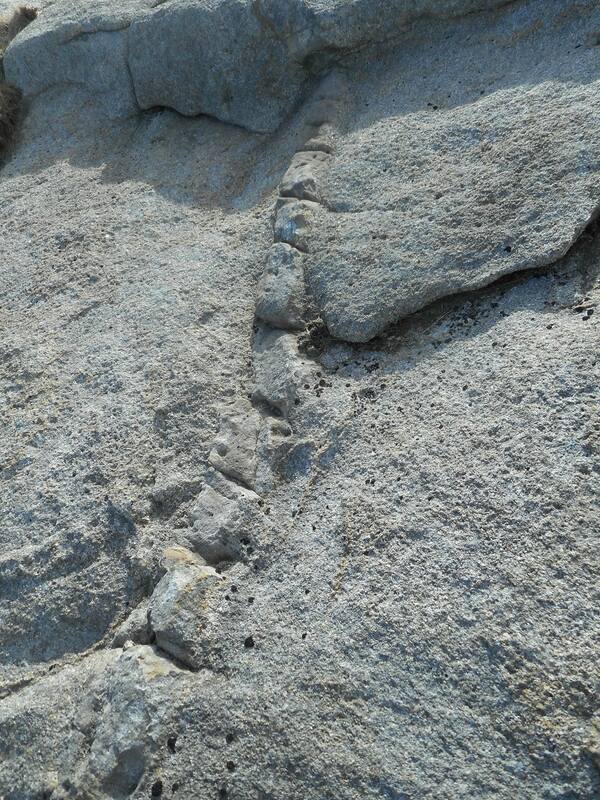 It may be relatively small, but what really impresses is the regularity of the formations. 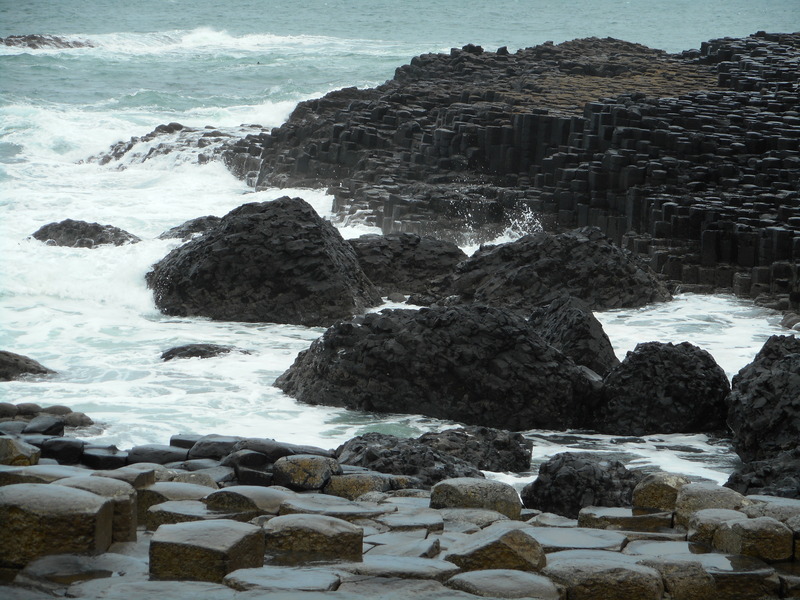 Legend has it that the Causeway was created by the Celtic giant Fionn mac Cumhaill (or Finn MacCool), so that he could fight his Scottish counterpart, Benandonner. 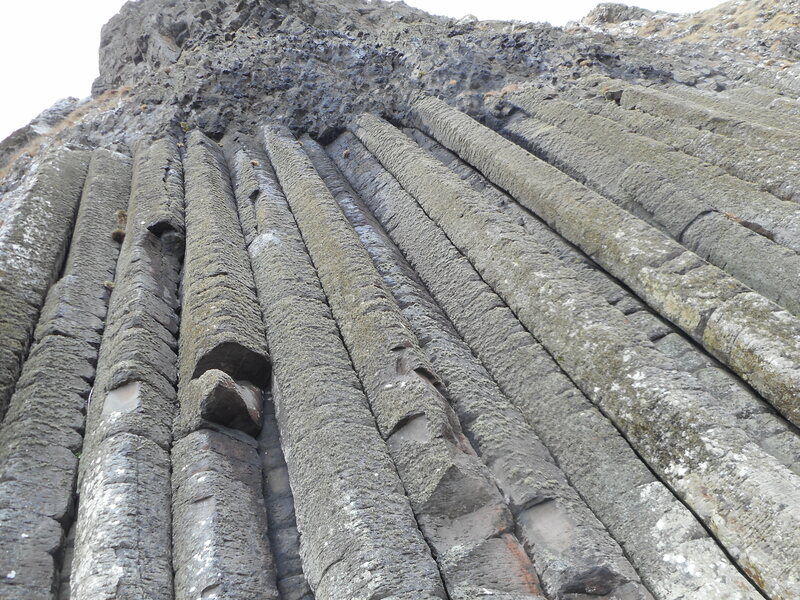 Perhaps this story was inspired by the presence of very similar formations on Staffa in the Inner Hebrides. 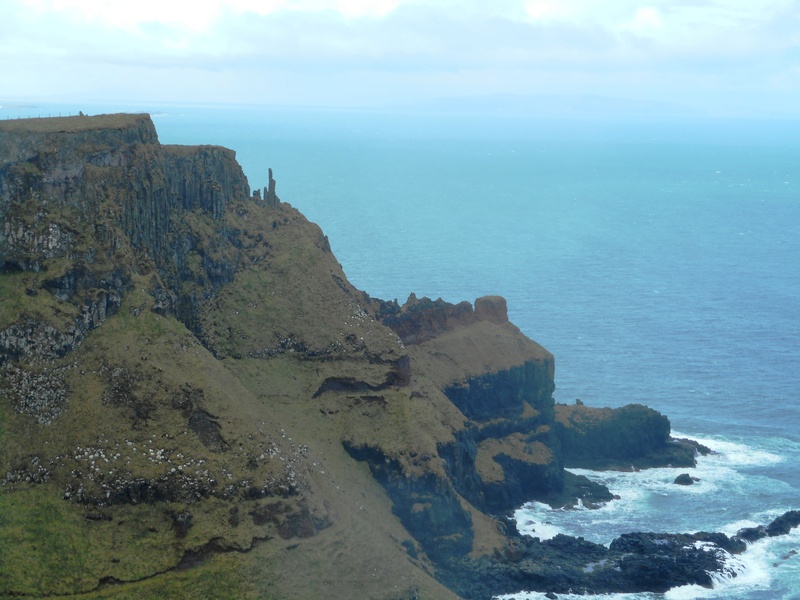 After all, at that time, it would have been much easier for the people of Antrim to travel to the Hebrides than to the rest of Ireland. 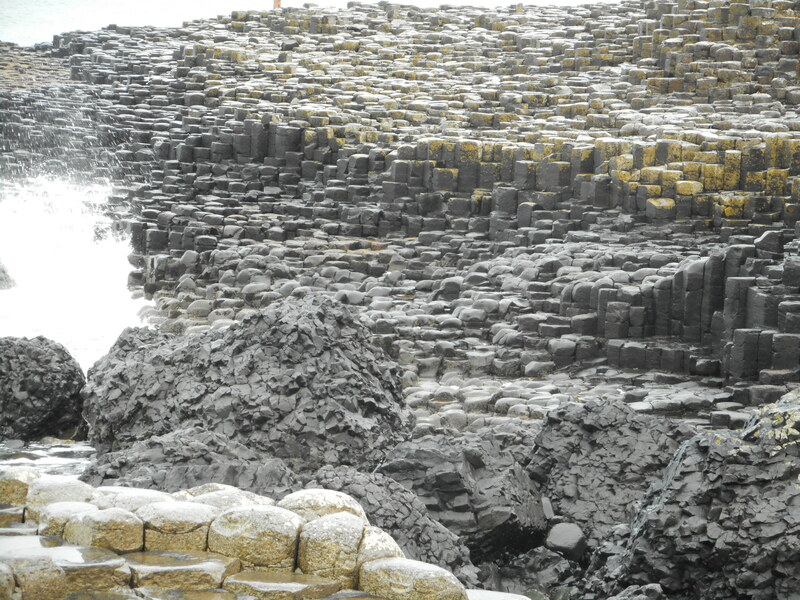 However, scientists now tell us that the 40 000 hexagonal columns are the result of a vertical breakage pattern in a cooling basaltic lava flow. 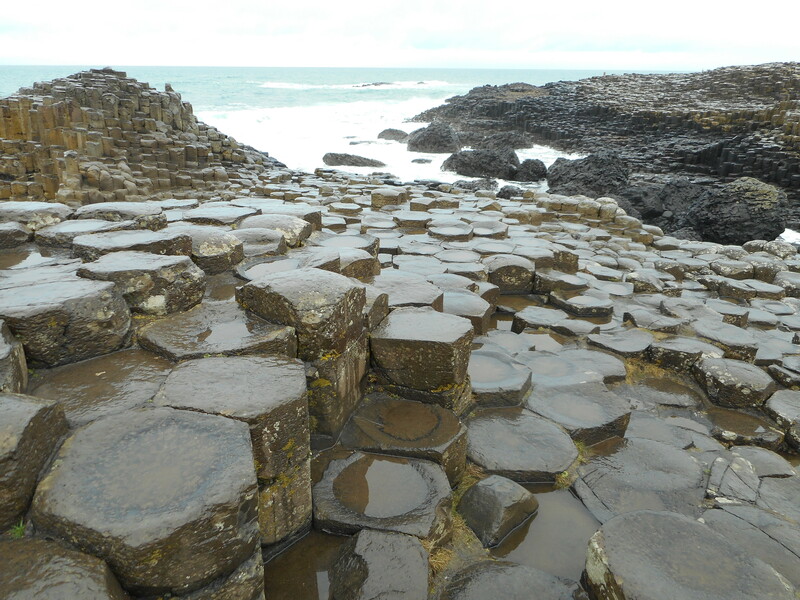 Although the Causeway is the highlight of this stretch of coastline, there are many fascinating formations to be found elsewhere. 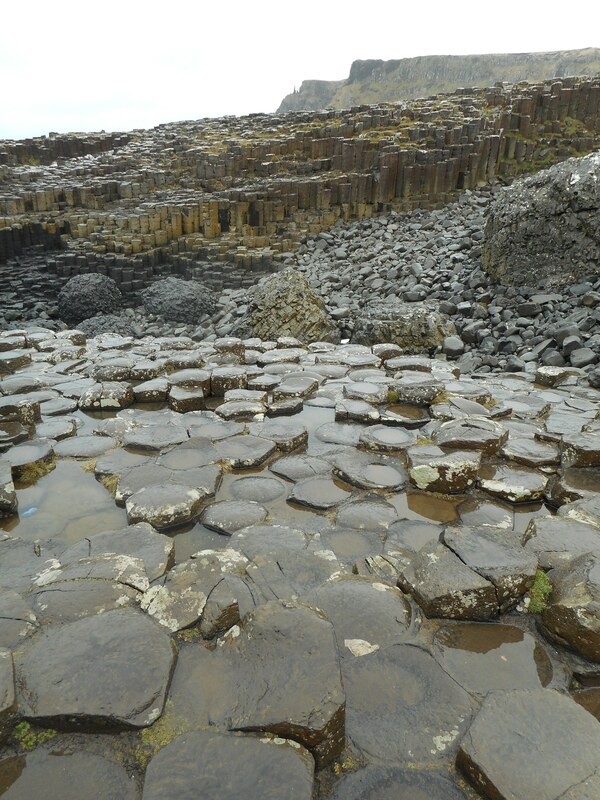 Just beyond the Causeway is the Giant’s Boot, and beyond that, the Organ Pipes and the Chimney Tops. 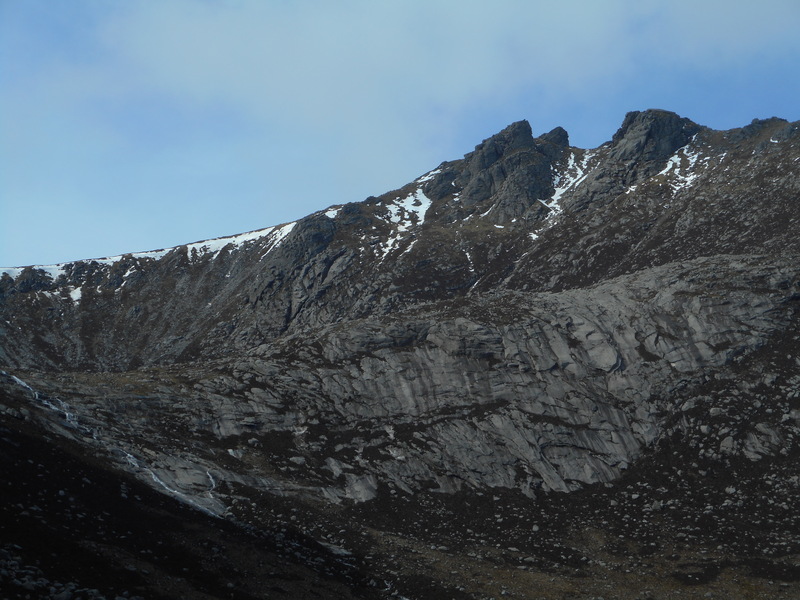 Unfortunately, the exciting traverse path (visible on the above photo) is closed from a point just before the Chimney Tops are reached, due to land slippage. 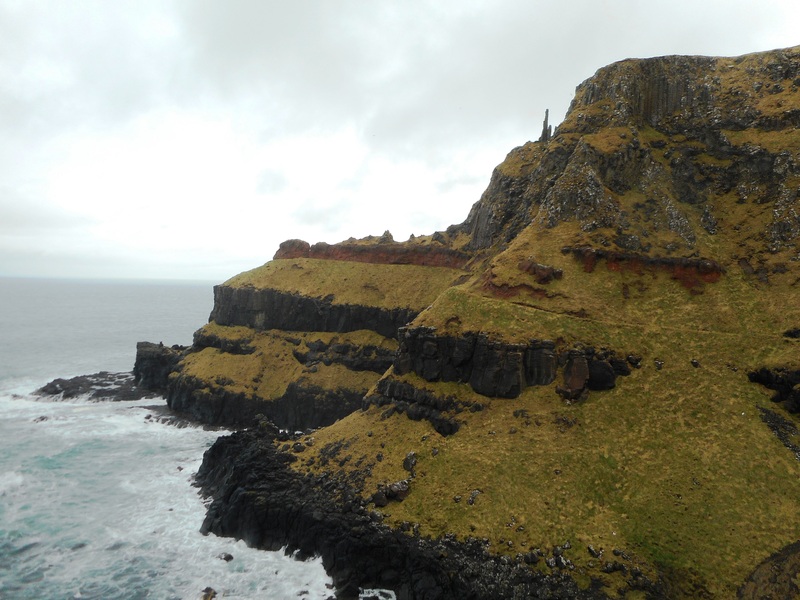 We therefore had to turn around and ascend to the clifftops via the Shepherds Steps. 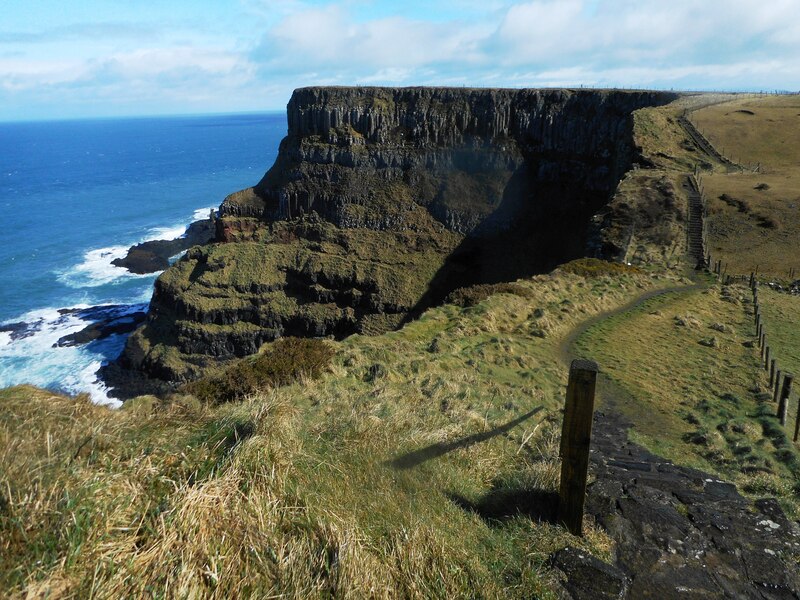 The cliff path is still a fantastic walk, though the lower path looks even better, and it’s sufficiently obvious that I think some daredevils must disregard the signs and barriers and use it regardless. Luckily, the weather improved considerably shortly after we set out along the clifftops, and sun even began to shine! Not so luckily, a couple of wet spots went unnoticed on the camera lens for a while, so some of the pictures are slightly spoiled by this. 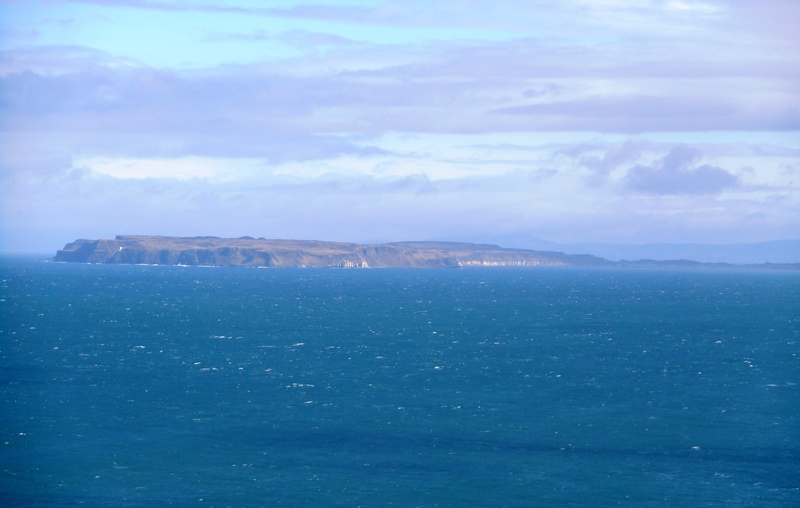 The visibility even improved enough at time to allow us glimpses of Islay, with Rathlin was also being in view for much of the route. 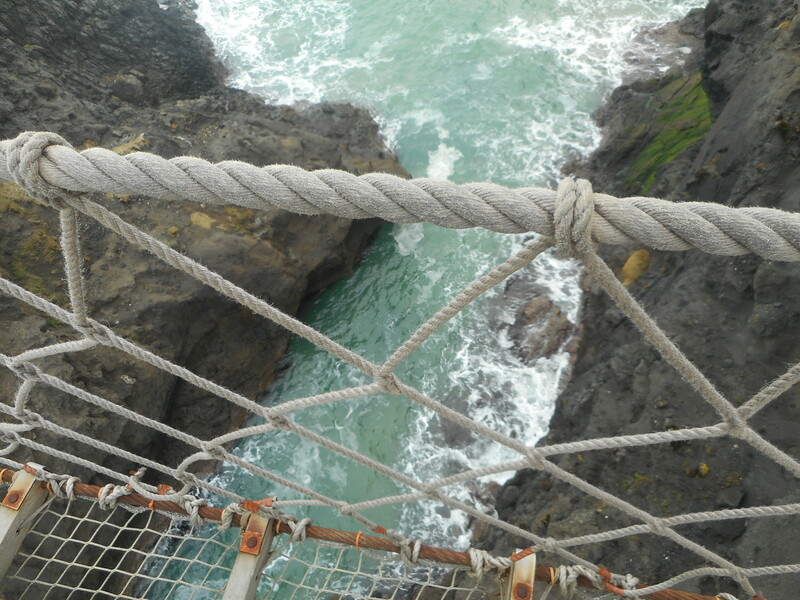 The whole route is so spectacular that it was hard to know when to stop taking photographs. 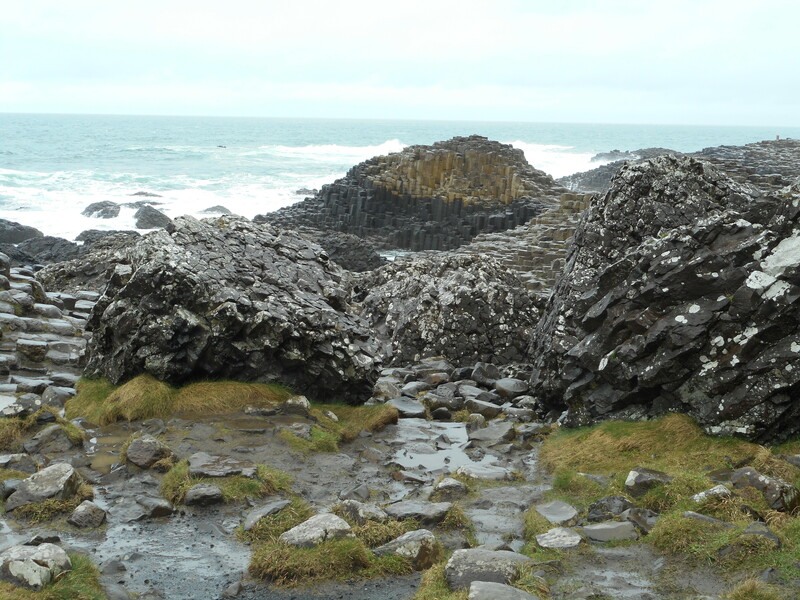 Here is just a selection from the next section, as we headed for Dunseverick Castle. 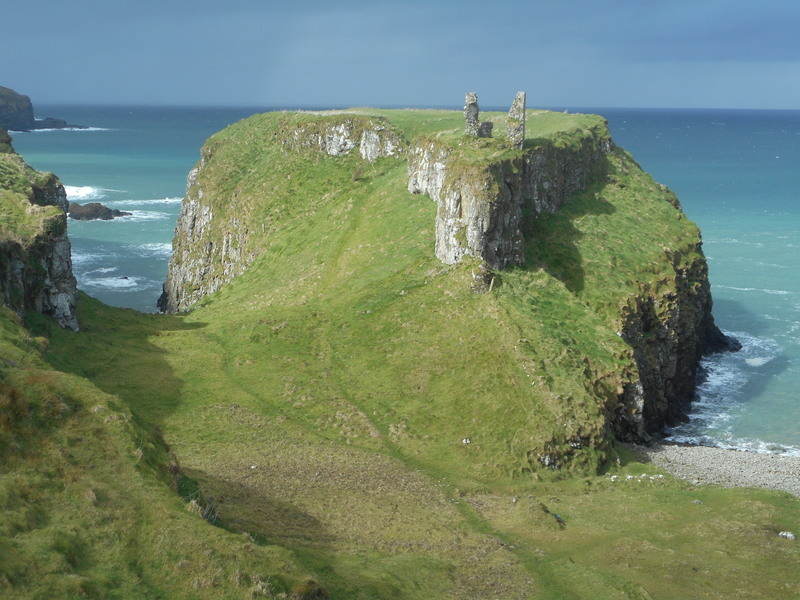 There isn’t much left of Dunseverick Castle these days, but the setting is impressive enough. 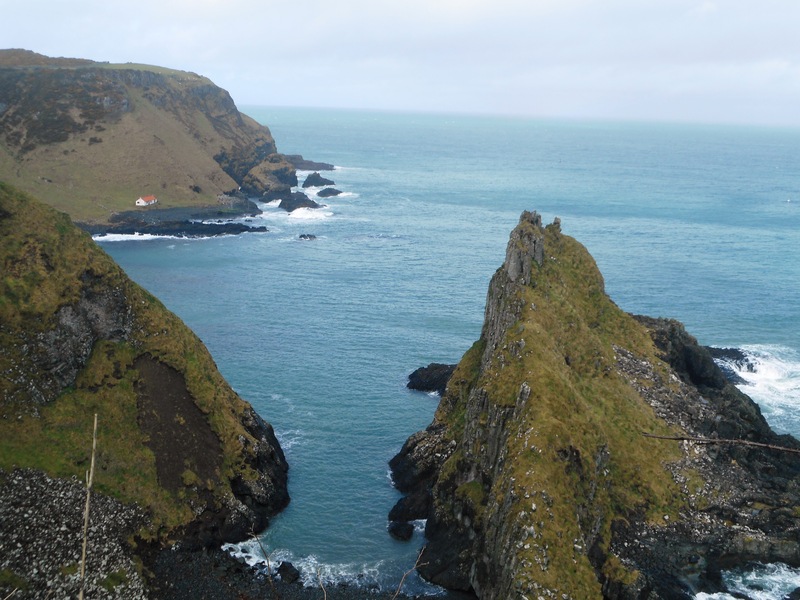 Beyond Dunseverick Harbour, another section of the route has had to be re-routed due to land slippage. Rather foolishly, we mistook the new path for the road-walking diversion that had been in place during its construction, and so ended up on the old path which although passable, was certainly rather awkward. 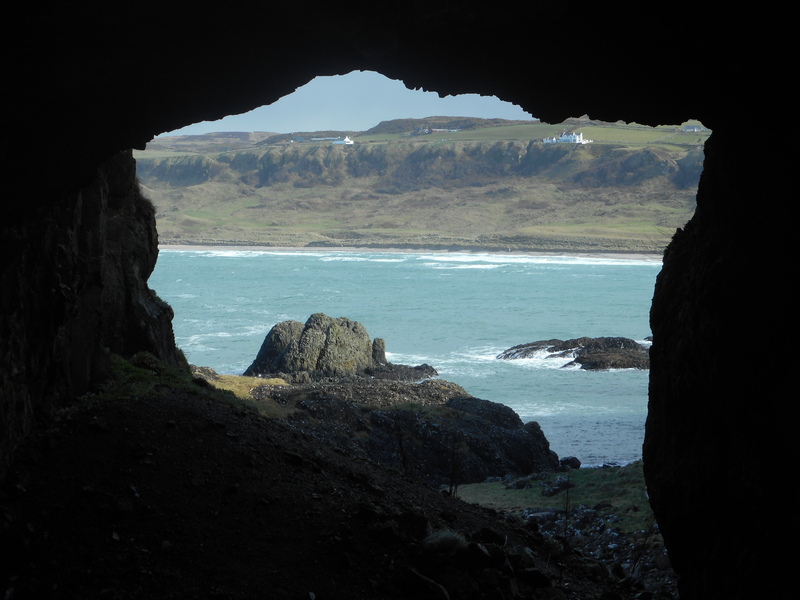 Shortly after this point, the path passes through a natural tunnel, which gives a lovely view of the wide sandy sweep of White Park Bay. 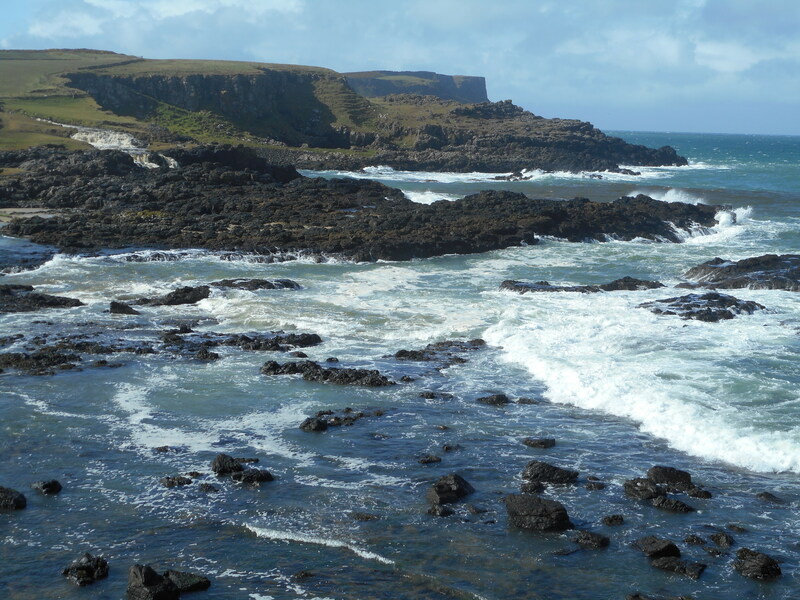 The next stage of the walk is a rather awkward clamber across slippery rocks, before crossing the full length of White Park Bay to reach Ballintoy. 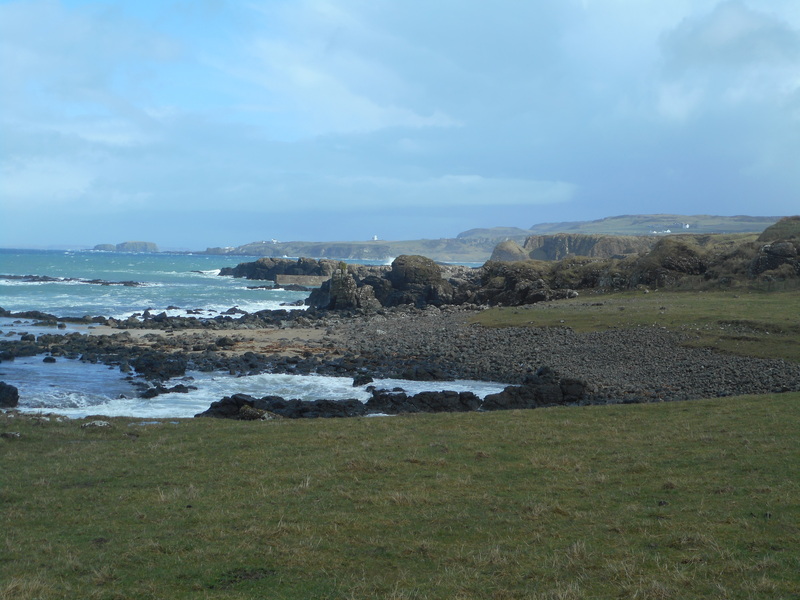 Beyond Ballintoy, the coast coast is left (though only briefly) for the only time in the entire route, before rejoining it for the last half mile to Carrick-a-Rede. 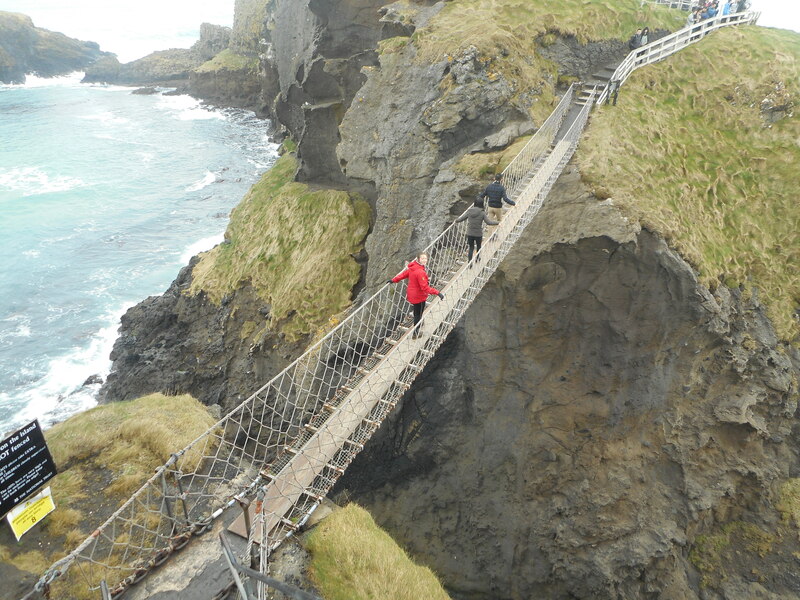 We arrived at Carrick-a-Rede to discover that the rope bridge had already closed for the day, which was a shame as this would have made a fantastic finale to the walk. Luckily, all was not lost as we were able to return the next morning, which at least meant that we were able to devote the time it deserved. 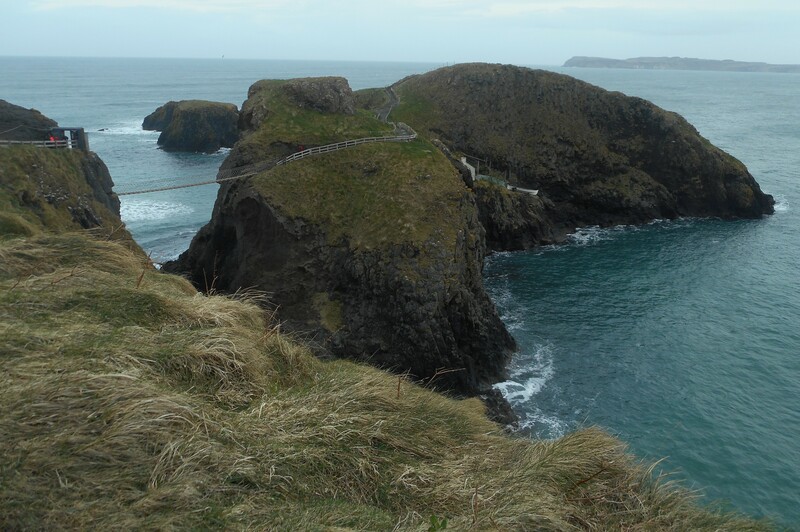 The rope bridge was originally constructed to allow salmon fishermen to access the tiny island of Carrick-a-Rede, which lies on the migration route for Atlantic salmon (hence the name, which means ‘rock in the road’ in Scottish Gaelic). It has now been in use for around 300 years. 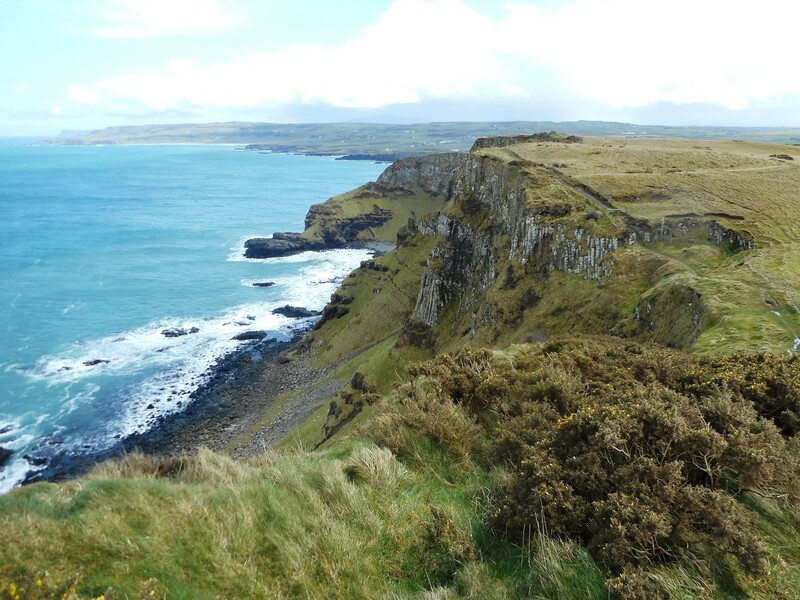 It certainly makes a wonderful end point for this magnificent and varied walk along the north Antrim coast. Some photos by Georgina Collins. 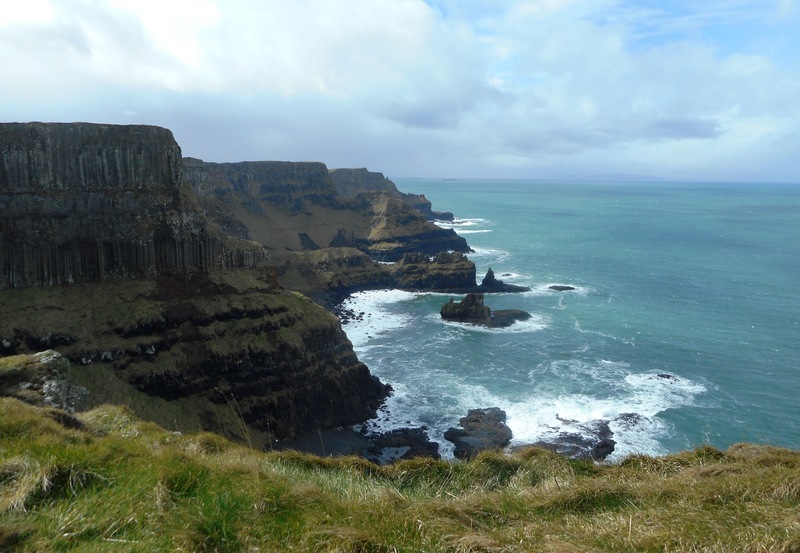 This entry was posted in Ireland on May 5, 2015 by neilsmountains.